Hope Is Real! : Events! The Fat Boy Chronicles and In Our Own Voice! Events! The Fat Boy Chronicles and In Our Own Voice! I have decided that I'm going to have an 'events' area on the right side of my blog for events related to disability, gay rights, feminism, or simply recovery in general. Most of them will be in the Atlanta area. I had this on my other blog, Femi-Nation, when it was up and I don't know why I didn't think about doing it for this one! If you know of an event that goes along with the theme of my blog, then send me an email at hopeisreal42@yahoo.com and I might advertise it here. In fact, if you want to contact me for support or questions, then you may email me at that address too. I'll put that contact info on the right also. **This movie is suitable for ages 10 and up. More Info: Aurora Cineplex is celebrating the arrival of The Fat Boy Chronicles with an “Atlanta Red Carpet Event”. The event will host the director, screenwriter, and stars of the film who will discuss the movie and answer questions from the audience! The Fat Boy Chronicles, based on a real life story, is a fantastic film that addresses the painful struggles of bullying and self-esteem. This film will touch your heart and possibly change your life. 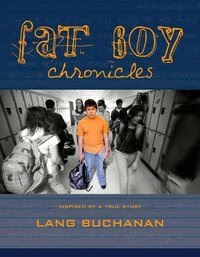 Movie Synopsis: Inspired by a true story, The Fat Boy Chronicles reveals the emotionally painful world obese teens experience in the face of a thin-obsessed society. At age fourteen. 5'5 Jimmy weighs 187 pounds. Outside the comfort of his family and church, life for Jimmy is a constant struggle. The cruel taunts of his classmates make going to school or playing sports a humiliating experience. Yet, he still manages to focus on his goals -- to lose weight and win over the girl of his dreams. My Thoughts: I've been to Aurora Cinema and it's a great theater, with miniature golf right next to it. I won't be there for three reasons: 1) Most importantly, I am going to a friend's handbell concert at the same time. I hear The Atlanta Concert Ringers are really good! 2) I don't support dieting, especially dieting by children and teens. I believe it ruins one's metabolism and ultimately, one's self-esteem. I am supporting this movie, however, because it is about how fat kids are bullied and I think that is an important topic. 3) The topic of dieting and watching bullying in action would probably be triggering to me. If you can handle it, I encourage you to watch it and let me know what you think! More Info: In Our Own Voice (IOOV) is a program developed by the National Alliance on Mental Illness (NAMI). Ashley Smith, from the blog, Overcoming Schizophrenia, and I will talk about our experience of being diagnosed with a mental illness and our recovery. There will also be a short video about people with mental illness and plenty of time for questions. The purpose of the presentation is to help reduce the stigma currently surrounding mental illness. My thoughts: I hope you come! Hopefully you will leave inspired and having learned a lot. Charis is one of my favorite places and I am very honored to be speaking there. Circle of Grace is my church and I am proud that they are willing to cosponsor this event. I am excited too! This will be my first time presenting, so I'm a little nervous, especially since it will be almost all the people I hold dear there. I feel very proud to be doing this.